With a knife, cut a small slit in the center of the top of the yogurt cup. Insert a popsicle stick. Place yogurt into the freezer and allow to freeze completely, at least overnight. When ready to eat, peel the foil top off of the yogurt. Run the yogurt container under hot tap water, but avoid getting water on the yogurt. Gently pull the yogurt pop from the container. If desired, roll pop into sprinkles, crushed cereal or chopped nuts. To catch drips, snip a hole at the bottom of a cupcake liner and slide on the stick under the yogurt pop. 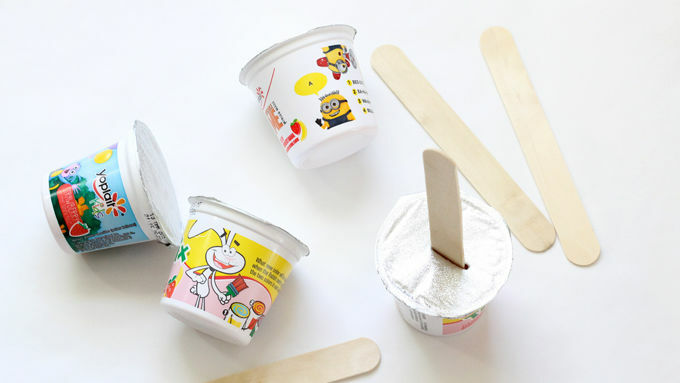 Try this fun idea with any of your favorite yogurt cups. 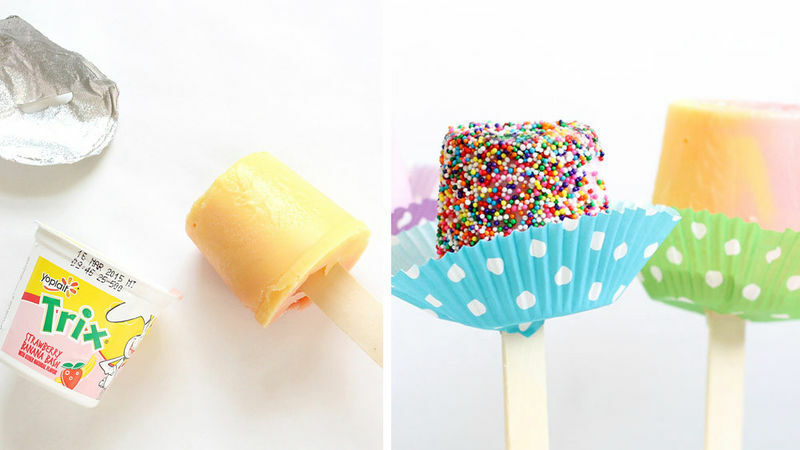 The perfect snack hack: frozen yogurt popsicles that are as easy as 1-2-3. 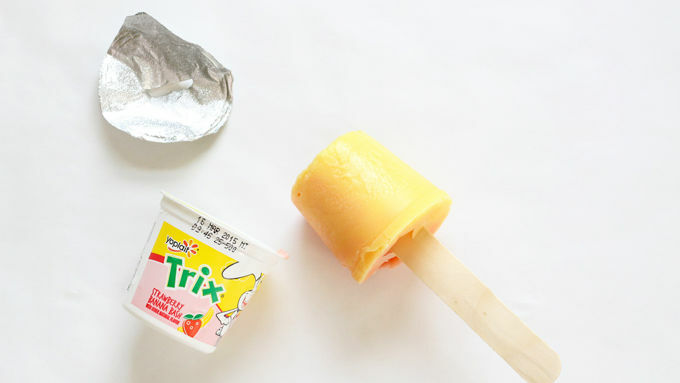 Just pop a stick in a yogurt cup and freeze it. That's it! You know when people say “It’s the little things…”? They mean frozen yogurt snack hacks. It’s one of those little things that makes life better. This recipe is so easy that “recipe” needs to be in quotes, because “slide a stick in yogurt and freeze” is all you need to do. And, I, for one, think this healthy treat tastes even better than ice cream (this coming from a longtime ice cream addict). 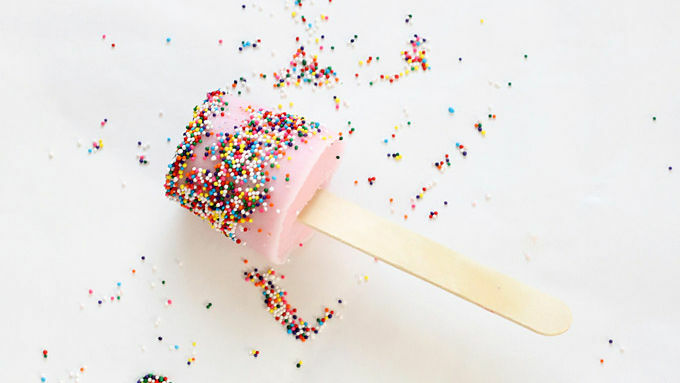 If you really want to go bonkers, roll the fro yo pop in sprinkles. I used the Yoplait™ kids yogurts because they come in cool flavors. Plus, when they're frozen, you can easily remove them from the containers. A word of caution: Don’t choose the traditional Yoplait™ containers that are bigger on the bottom than the top because you can’t slide them out of the container when they freeze! You probably already know this because of logic and common sense. I know this because of experience. As soon as I froze those I considered returning my graduate degrees. Sigh. But if you wish to forgo the stick… you can freeze traditional Yoplait™ containers and melt them just enough so you can spoon out the deliciousness. Start with unopened containers of yogurt. Then simply insert frozen-pop sticks into the foil tops. The foil keeps the stick in place as the yogurt freezes. (If necessary, use a sharp knife to make a small slit first.) Place yogurts in the freezer overnight. When you're ready to eat, peel off the foil top. Run hot tap water on the yogurt container for just a few seconds, being careful not to get water on the yogurt itself. Then gently pull the pop from the container. It’s just that easy. You can roll the pop in sprinkles if you wish. Once the yogurt starts to melt just slightly, the sprinkles stick easily. And one more hack for the hack: To prevent drips, cut a small slit in the bottom of a cupcake liner and slide it on the stick. Now you're ready to snack!